If you’re looking for an additional level of convenience, an automatic transfer system may be the solution for you – convey bulk wood pellets from storage to your heating appliance (auto-transfer systems usually involve a central heating unit engineered to accept auto-delivery of pellets). The following examples all require the installation of an electric auger or pneumatic delivery system. This is a 500 lb. hopper available through Pellergy in Montpelier, VT. It needs to be filled manually by homeowner, but then you have a 1-2 week supply of pellets available for the appliance. This is a typical European-style bulk storage silo. General dimensions are 8’ x 8’ x 7’high. Pellets are delivered by a blower truck and then conveyed through bottom of silo with either an electric auger or a pneumatic device. 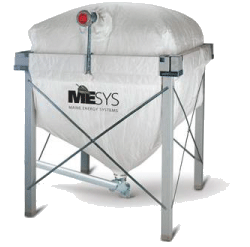 This is another example of the Euro-style, static dissipative sack. 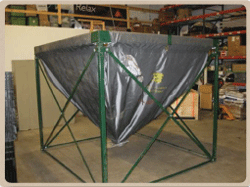 Generally, these are designed to hold between 3 and 6 tons of pellets. 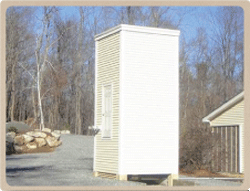 This one is available through Maine Energy Systems in Bethel, ME. 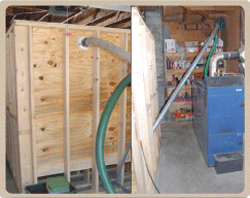 This is an example of a stick-built hopper in a homeowner’s basement. 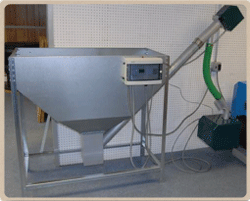 Special attention needs to be given to (1) designing bottom of hopper so pellets flow freely and (2) ensuring the unit is air-tight to prevent dust from leaking through joints during delivery. 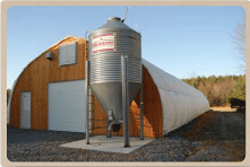 This is a conventional, agricultural-type exterior silo employed for wood pellet storage. 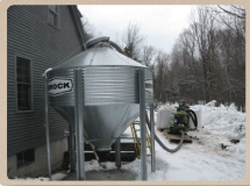 Another exterior silo; this one is providing fuel for a commercial greenhouse in Vermont.